This is a shorter version of the Super Betasso/Benjamin ride that starts from town. Betasso is a good but short ride close to Boulder. 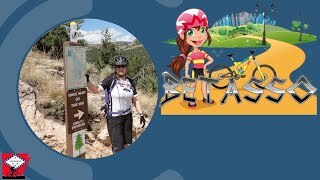 It's not the best ride around, but it's very popular because it can easily be ridden from town by cruising up Boulder Canyon on the bike path, and riding the steep Betasso Link Trail up to the trailhead. The bike directionality changes month-to-month. Please check and follow signage at the trailhead. There can be heavy hiker traffic on this trail, and the riding direction for bikers is determined by a sign at the start of the ride. Pay attention to the ride direction, and please be courteous to hikers. Starting from the trailhead, you'll find yourself on the Canyon Loop. The riding direction is predetermined, and indicated on signs along the trail. Pay attention to this direction and adhere to it - the trail is carefully monitored due to the extremely high traffic and its proximity to Boulder. The Canyon Loop is a relatively quick loop (15-20 minutes) that can be ridden by most riders. It's got enough twisty singletrack and fast sections to keep expert riders entertained, but the lack of any extremely difficult moves or dangerous areas will allow intermediate riders to feel comfortable as well. Beginners might want to dismount for a tight right-hand turn on the downhill section, two stream crossings, and a couple of fairly steep (for beginners) uphill rock/root crossings, but even beginners will find that the enjoyment and beauty outweigh the frustrations by far. The trail surface is dry, hard-packed dirt most of the way, with a short section that winds through slightly more lush forest. There are some nice views along the way, looking out over the hilly terrain of the foothills. New as of May 2011 is the Benjamin Loop, which starts as a spur off of the farthest point on the Canyon Loop. This new trail was built by large groups of volunteers, and features significantly more interesting terrain than the Canyon Loop. This trail winds through thick forest, and in places is cut right into the side of rock faces that required major engineering feats to build. The new trail flows very well, and offers a nice 4 mile addition to the original trail. If you're still feeling fresh after one loop, do a couple more, and throw some burgers on the grill back at the trailhead when you're done. Many Boulder riders choose to cruise up the Boulder Canyon bike path along Canyon road (119). The path eventually dead-ends and forces you onto the road, and you'll ride a quick 1/2 mile section of road with ample shoulders until you get to a small trailhead on the North side of the road. From there, you can ride up the steep Betasso Link Trail to join the Canyon Loop. The area near Betasso preserve called Orodell was a small mining town in the late 1800's but was completely destroyed by wildfire in 1894. The mining operations there never recovered, but the land was homesteaded in the early 1900's, and in 1915 Steve Betasso, a local miner, purchased a small ranch here. The Betasso family expanded the ranch through proceeds from their lucrative mining operations, and In 1976, Boulder County purchased 712 acres of the ranch from Ernie Betasso, one of Steve's sons. Ernie, worked with Boulder County Parks and Open Space department until the early 80's to ensure that others could enjoy the land that his family enjoyed for many years. Boulder County purchased additional land in 2007, and this open space area now includes nearly 1200 acres of land for the public to enjoy. Nice trail. Needed more cardio for sure!! Beautiful scenery! I had a lot of fun here didn’t get there till almost 1pm worked out fantastic. Little bit of everything. only stopped once for a deer and couldn't quite make it up one rock feature. getting better! didn't do 2nd loop dammit! Easy non tech ride. Cool forest and fast. Will be nasty when this bit of snow melts! Fantastic loop. Nice flow with a sprinkling of small technical sections. Make sure to follow the direction arrows on the trail signs, not on the map. Quick Sunday jaunt to start the week. Cruising down the Benjamin Loop. Progression of the Betasso climb in three shots. 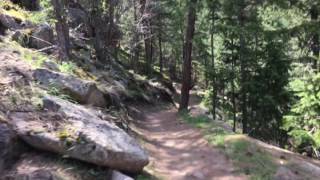 Sweet smooth singletrack through rough terrain! Arriving at the Benjamin loop from the connector. Grippin' and rippin' around a tight Betasso berm. Highlights from a Betasso ride. Plenty places to have lunch.